We are proud to be sponsoring the revival of this fun New Bern tradition! 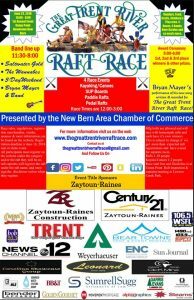 The Great Trent River Raft Race is back! In the 70’s and early 80’s there was an event….an event that drew thousands to the shores of the Trent River to watch a spectacle like no other. Hundreds of participants built homemade rafts and raced in The Great Trent River Raft Race. A couple of decades later the race is back! June 2018 will see the return of the race to New Bern NC – so grab your paddle board, jump in your kayak, build a paddle raft of your own, or get together with friends and show off your engineering skills and build the fastest pedal raft on the water! Design It – Build It – Race It!